A new album calls for a new website, don’t you agree? 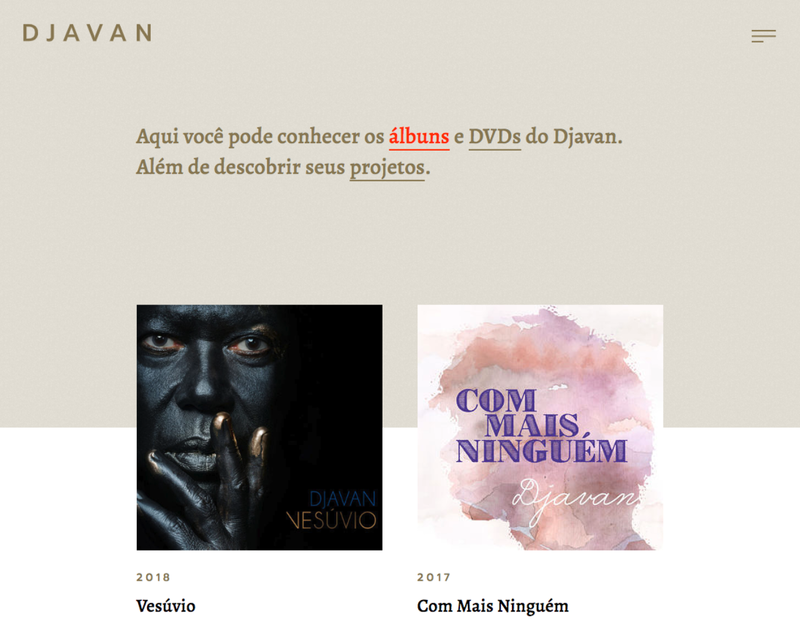 That’s why we prepared this new portal with lots of information about “Vesúvio” and Djavan’s career, for the joy of all “Djafans”. Shall we introduce you to the different areas of our website? The fans favorite part! 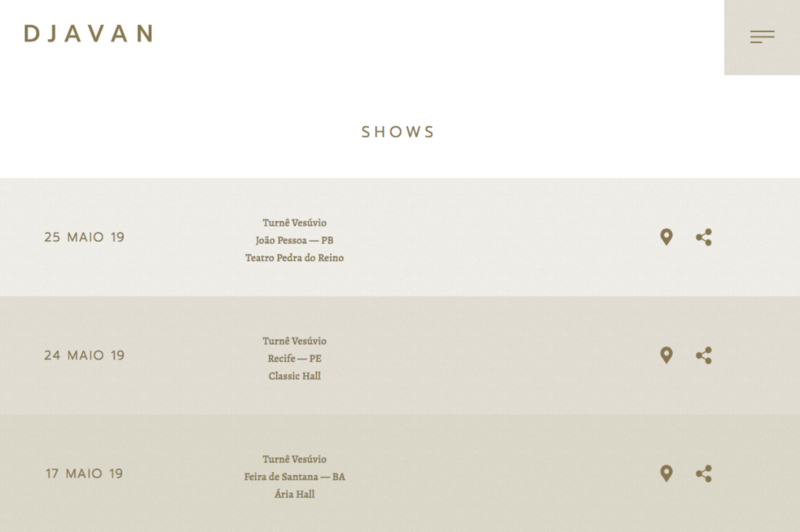 Here you can find the dates officially confirmed for the new tour with links to ticket sales platforms and concerts’ locations. Very important: you will only be able to find information on confirmed concerts and official links for purchasing your tickets here on the website, or at the Djavan’s social media pages. Do not buy from unauthorized websites or scalpers. Tickets could be fake! 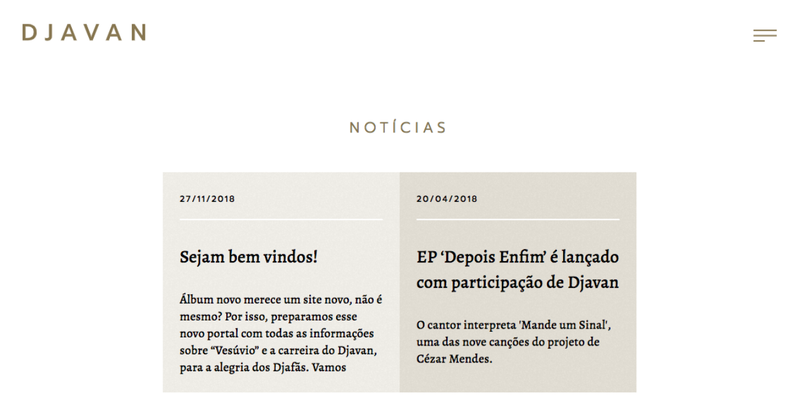 Would you like to know what has been going on with Djavan? You are in the right place! News impact, personal texts, concerts’ critics, backstage… There’s always something fresh! A career of more than 40 years deserves a biography to match such a great achievement, isn’t it? 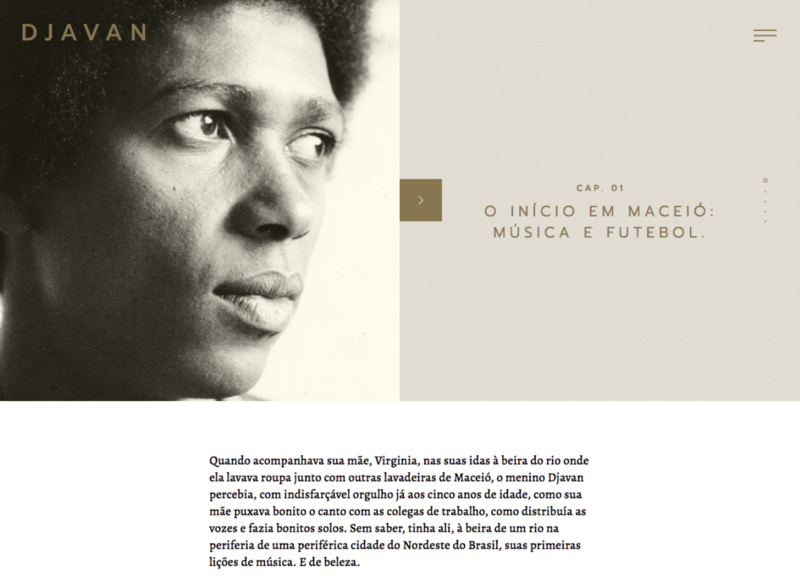 “While still a boy, at the age of five, Djavan used to go with his mother, Virginia, to the river bank where she did laundry with other laundresses from Maceió. It was with undisguisable pride for such a young boy that he noticed how beautiful his mother and her friends sang, and how she was able to coordinate their voices and sing amazing solos. He did not know it then, but it was there, by a river bank in the outskirts of a Northeastern Brazilian city that he had his first music lessons. Lessons of music and beauty.”. This is another section “Djafans” will love! 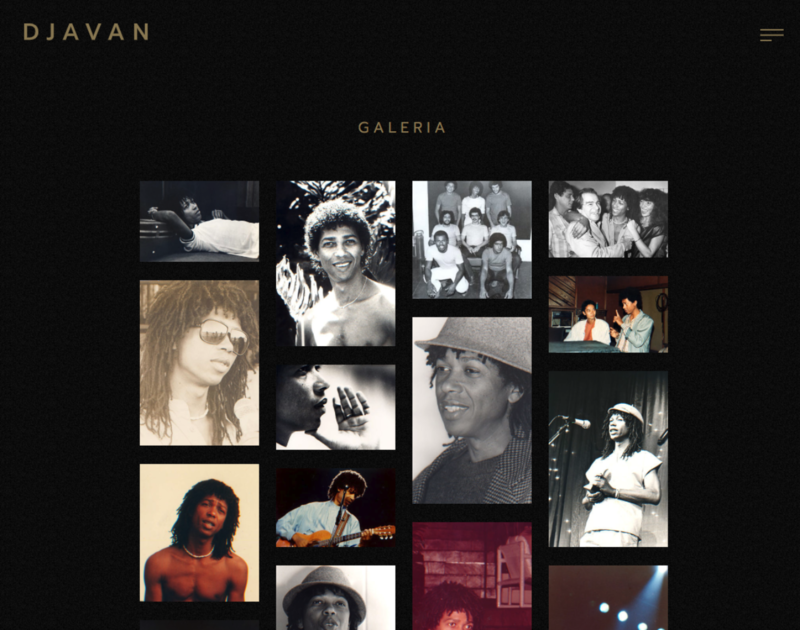 A special selection from personal archives and backstage pictures which document special moments from Djavan’s career and personal life, and it will always be updated! Would you like to have Djavan’s customized products? Only here you can find all official products carefully designed for all “Djafans”. Website news! 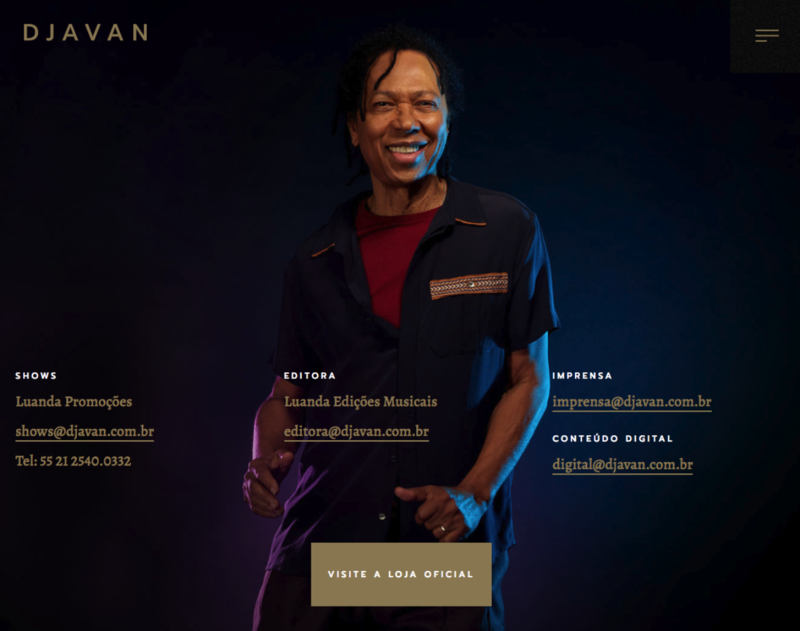 Sign up for Djavan’s mailing list to eventually receive news about concerts, special discounts, sales and much more! And don’t worry: your personal information will be used exclusively for the remittance of information and news about Djavan. You can also find in this section the contact information to hire a concert, request interviews and the editor’s contact.